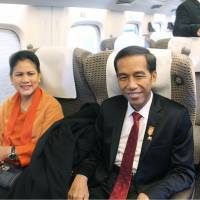 Indonesian President Joko “Jokowi” Widodo rode on a bullet train Wednesday from Tokyo to Nagoya as Japan tries to sell a high-speed rail system to Indonesia. The Japan International Cooperation Agency is conducting a feasibility study on Indonesia’s possible introduction of a Japanese bullet train system for a planned 730-km high-speed railway between Jakarta and Surabaya on Java Island. After his ride on the Nozomi 311, the Indonesian leader said his country will decide whether to go ahead with the plan sometime this year. “We will see. . . . Whether it will be (built) from Jakarta-Bandung or Jakarta-Surabaya (we will decide) this year,” Jokowi told reporters. Several companies from Japan, South Korea and China have expressed interest in the project. JICA began an initial study for a high-speed train running between Jakarta and Bandung in 2012. The study will be finished this May. Jokowi later visited Toyota Motor Corp.’s Motomachi plant in Aichi Prefecture. He exchanged opinions with Toyota President Akio Toyoda on Indonesia’s automobile industry. Toyoda said he is willing to cooperate with Indonesia’s economic expansion through capital investment in the country and exporting passenger cars produced at a local Toyota plant. The plant manufactures models, including the Etios compact sedan, that form the backbone of the cars it sells in developing nations. Later in the day, Jokowi traveled to China, the second and final leg of his trip.